Brighton's winter starling murmurations are a natural wonder to behold. (CNN) - Britain's beaches hide a wintry secret far removed from the heady warm weather days of ice creams, sunbathing and wading in the shallows. The fact is the stirring strands and quiet coves are at their best when the days are short and the weather unpredictable. It's a time for windswept walks along empty shores, bizarre wildlife phenomena and the chance to cozy up in the pub once the sun goes down. Here are 12 of the best winter beaches for bracing pleasure. The only place in the UK classed as a desert, the shingle bank of Dungeness has a bleakness and unique beauty that comes into its own once the nights draw in and the winds whip up from the English Channel. Waterbirds overwinter at the national nature reserve, while Prospect Cottage, former home of film maker Derek Jarman, offers a glimpse of how life is lived on the edge of England. Lit by low winter sun, the lonely lighthouses and, yes, the brooding nuclear power station that dominates the horizon, lend this unique spot an otherworldly atmosphere that regularly draws both hardy fisherman and magazine fashion shoots. Tip: If things get too fresh, then The Pilot Inn's fish and chips are the ideal way to warm up. On a summer afternoon, Brighton's pebble beach throngs with day trippers down from London, the city's seagulls picking through discarded trash. Come winter, and with the tourists gone for the season, calm descends on one of Britain's most famous beaches. Locals gather to watch the nightly starling murmurations from late October until March. 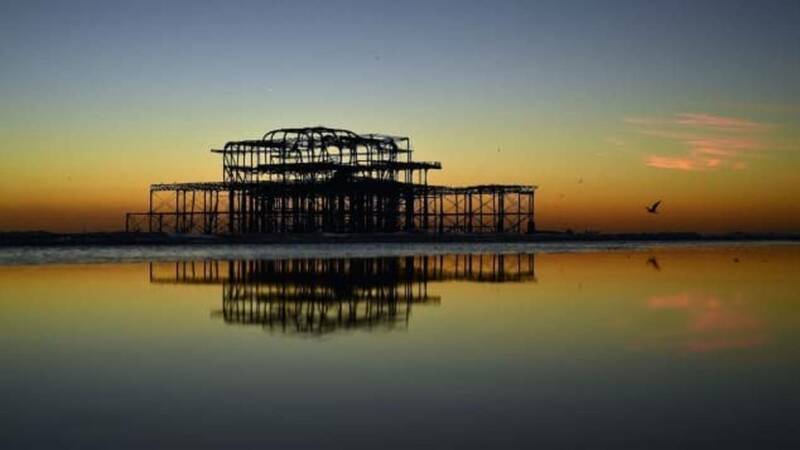 The birds flock to the water from their city roosts and form a giant, roiling wave, arcing through the sky above the burnt out West Pier as the sun dips into the sea. Tip: Brighton's new bike share scheme is a great way to cycle along the front as the sun sets. The vast, open sands of Holkham, on the north Norfolk coast, offer the perfect chance for a long winter walk without encountering anything other than the occasional seabird or a resting seal. The latter breed in large colonies throughout the winter along the coast at Blakeney Point and can often be seen in the water or out on the sandbanks at Holkham during the colder months. Wells-Next-The-Sea is a great stop for first-rate seafood. Tip: Nearby Holkham Hall is steeped in history and is the ideal place to warm up after a day on the beach. Merseyside's Crosby Beach is home to "Another Place," an art installation by Antony Gormley featuring 100 life-size sculptures. When the winter weather hits, these metal creations change daily, collecting barnacles and seaweed and appearing worn as the wind whistles across the Irish Sea. The late afternoon, just before sunset, with birds piping overhead, is best for the full, atmospheric winter experience. Tip: Low tide is the best time to see Another Place. Northumberland is home to some of England's finest beaches, and Bamburgh is arguably the best of the lot. Buffeted by the high waves of the North Sea and loomed over by a vertiginous Norman castle, few places on the coast of Britain can match its eerie atmosphere on a cold winter's day. The nearby village of the same name is home to an excellent tea shop offering a hot brew and a slice of cake to round off a walk among the dunes. Tip: Why not search out the grave and memorial to Grace Horsley Darling in Bamburgh's parish church. Darling became a national heroine in 1838 after she saved the lives of nine sailors shipwrecked off the beach. Often described as the most beautiful beach in Wales, Rhossili Bay on the Gower peninsula is as much a winter beach as a summer one. Its three miles of sands make for an easy walk even when the wind is up, the high waves tempting in surfers no matter the weather. Adventurous souls can cross the causeway to Worm's Head at low tide, but should be aware that it is only accessible for two-and-a-half hours before and after low tide. Best of all, there are fewer visitors once the temperature drops, leaving plenty of beach for everyone to explore. Tip: The Worm's Head Hotel offers stunning views of Rhossili from the comfort of the bar. The beaches in western Scotland vary wildly, from quiet, sandy coves to vast bays where the Atlantic rages. Machir Bay, on the island of Islay, is undoubtedly one of the country's most beautiful, especially when the winter storms pile in and the waves slam onto shore. Guaranteed to blow away the cobwebs after a night on the local single malt, a winter's morning here is truly exhilarating and far more fun than visiting on a benign summer's day. Tip: The nearby Kilchoman distillery offers the chance to enjoy some of Scotland's finest whisky. The northern stretch of St. Ives Bay is home to Godrevy beach, one of the most exposed stretches of coastline on the northern coast of Cornwall. Huge Atlantic swells batter the coast here during winter, but on calmer days, its three miles of soft, golden sands offer pleasant walking in bracing winds and the chance to give the dog a stretch too (they're not allowed on the beach between Easter and September). The white lighthouse on Godrevy Island, which sits at the tip of the bay, was the inspiration for Virginia Woolf's novel "To The Lighthouse." Tip: Binoculars are a very good idea. Seabirds and birds of prey, including Merlin, are easily spotted around Godrevy. There's something undeniably alluring about the bleakness of Essex's beaches in winter. Jaywick, home to a small town of art-deco chalets, is something of a time warp, a once-popular holiday resort that has long since lost the attention of holidaymakers. As the waves roll in and the beach unfurls, there's no question that its famous sands are at their best in the winter months, with plenty of scope for moody introspection. Tip: A good local attraction is Jaywick's 19th-century Martello Tower, which was built during the Napoleonic Wars. Today it's a heritage and arts centre. The small village of Elgol, on the western coast of Skye, has a small, rocky beach that offers some of the most dramatic sunset views in the world, let alone the UK. With the soaring backdrop of the Cuillin mountains and the island of Rum in the distance, winter here can be rough, the weather changing by the hour. Skye's tourist numbers plummet when summer ends, meaning hardy visitors have this popular spot all to themselves. Tip: Along the single-track road towards Broadford are the fairy pools at Torrin. Less popular, but equally as beautiful as those at Glenbrittle on the far side of the island. Backed by the glowering mountains of the Snowdonia National Park, Barmouth Sands offers big views (on a clear day) out into the swirling Irish Sea. When the cloud rolls in, there's a moodiness here that's especially acute in winter. Well wrapped up, it's easy to lose a few hours exploring along the coast, looking out for seabirds. The wooden viaduct which carries trains across the Mawddach estuary makes this distant corner of north west Wales even more special. Tip: Turning your back on the sea, the stunning Rhinogs mountains have a particular majesty in winter. Beautiful, remote and unspoilt, Devon's Coastguards beach is well worth the long drive down winding country lanes. Accessible via a narrow slipway, the beach forms part of the Erme estuary, the tide swelling up to offer superb winter waves for windsurfers and adventurous water sports fans. Nearby Mothecombe Beach, popular in summer, clears out during winter, making it ripe for watching the waves crash in without another soul in sight. Both beaches are part of the private Flete Estate. Tip: A steaming cup of tea is the perfect accompaniment to admire the view across the estuary from the Schoolhouse Restaurant above the beach.